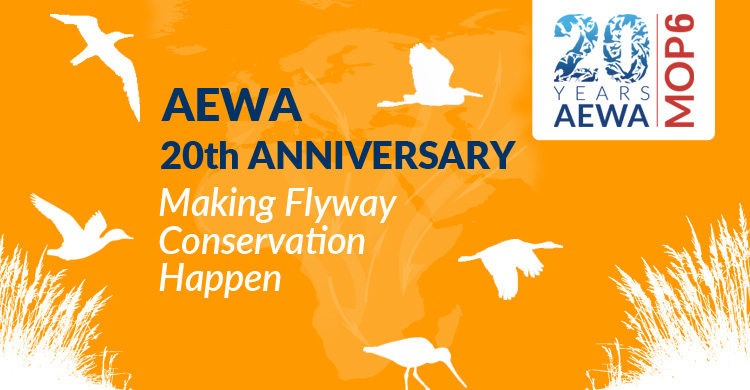 Bonn, 16 June 2015 - The 16th June 2005 marks the 20th anniversary of the culmination of the inter-governmental negotiations that led to the adoption of AEWA – the Agreement on the Conservation of African-Eurasian Migratory Waterbirds – an international treaty dedicated to conserving species such as cranes, storks, ducks and shorebirds that regularly travel along flyways that span continents and oceans. The treaty brings together countries and the wider international conservation community to conserve and manage 255 species of migratory waterbirds and the habitats, such as wetlands, upon which these species depend. The geographic region covered by AEWA includes the whole of Europe and Africa together with the Middle East, Central Asia and the Canadian Archipelago, making it the largest regional instrument of its kind concluded under the Convention on Migratory Species (CMS). A great deal has happened since the idea of an international treaty to cover waterbirds of the western Palaearctic was first put forward. The initial concrete proposal came from the IUCN in 1983 before the then newly established CMS assumed responsibility for taking the concept forward. At the First CMS Conference of the Parties, a resolution was passed calling for the Secretariat to take measures to develop Agreements for the White Stork and Western Palaearctic Anatidae. At an early stage, these two merged, evolving first into what was going to be called the Western Palaearctic Waterfowl Agreement and then finally into AEWA. When the Parties to AEWA meet for the sixth time in November this year in Bonn, they will be able to look back on twenty years of achievement and progress. AEWA has established itself as an effective, operational instrument delivering real conservation benefits on the ground for migratory waterbirds, their habitats and humans alike. This enviable reputation has no doubt been one of the prime reasons of the Agreement’s steady growth, having persuaded 75 of the 120 Range States – 35 from Africa and 40 from Eurasia - to become Parties. “Even the EU still drew up Action Plans that only covered European territory although many species spend the winter in Africa. AEWA was the first CMS Agreement to encompass several continents. Through the successful implementation over the years, AEWA has attracted 75 Parties and if you look back you will see that this growth has also led to an increase of CMS Parties in the African-Eurasian region as well,” says Bert Lenten, the first Executive Secretary of AEWA who is now the Deputy Executive Secretary of the parent Convention. 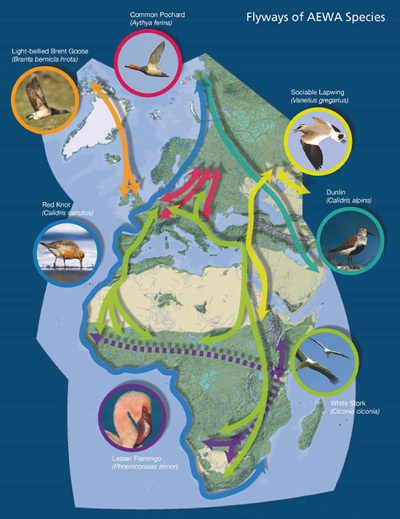 The transboundary nature of migratory species means that their conservation can only be assured if all countries where they breed, overwinter or pass through agree common objectives and cooperate to achieve them. AEWA deals with a group of species dependent on similar habitats along one of the principal recognized flyways that covers Africa and Eurasia. This clear focus allows AEWA to concentrate on developing appropriate policy responses to the challenges faced by the many species that the treaty covers. Those that drafted the Agreement realized that to be effective, AEWA needed to be properly represented in both Africa and Eurasia, and consequently the provisions included a requirement that for the Agreement to enter into force, seven countries from each of the two sub-regions should ratify. Jacques Trouvilliez who took over as Executive Secretary of AEWA in June 2014, having been a member of the French delegation at the negotiations in 1995, comments “In the early days, AEWA’s focus was on addressing emergencies – and therefore the Agreement developed single species action plans for the most endangered species on the Annexes to address their poor conservation status.” With satisfactory progress having been made in arresting the decline of the most pressing cases, AEWA can start to turn its attention to sustainable use, too. One means of doing this is through the AEWA African Initiative, a tool that seeks to maximize the involvement of local communities, building on the progress made under the UNEP-GEF African-Eurasian Wings over Wetlands Flyway Project (WOW) – the most ambitious flyway-scale project in the AEWA region to date. Funded by the Global Environment Facility (GEF), WOW helped strengthen AEWA’s profile in Africa by engaging people that do not belong to the Agreement’s normal immediate constituency among conservationists. Administered, like its parent Convention, by the United Nations Environment Programme, AEWA enjoys close institutional and policy links with the Convention on Biological Diversity and contributes to the efforts to achieve Aichi Target 12 to prevent by 2020 the extinction of known threatened species and to improve and sustain the conservation status of species, especially those most in decline. AEWA has also enjoyed a fruitful relationship with the Ramsar Convention and a range of conservation NGOs. As well as the recognition by governments that international cooperation was the only way to achieve conservation aims the length of the African-Eurasian flyway, the other foundation of the Agreement was the dedication of a group of key individuals, who had the perspicacity and determination to reconcile the conflicting interests of conservationists, hunters and farmers to create an effective tool for conservation and sustainable use. We pay tribute to some of these people in the series People behind the Scenes where today we feature Gerard Boere from the Netherlands who more than most can stake a claim to being the “father of AEWA”. “Looking to the immediate future, two activities are going to be more prominent on our agenda over the coming years – further developing the African Initiative and working towards sustainable use and adaptive management – to achieve an equilibrium between conservation and human activities and ensuring that wider conservation objectives are met ”. This might mean taking action based on best practice and sound scientific modelling to ensure that numbers of AEWA species such as the Svalbard population of Pink-footed Goose are managed to reduce conflicts with farmers and wider conservation interests; the geese are overgrazing the tundra, which is also negatively affecting that of other endangered species which share the habitat. “Leaving nature to its own devices is not an option, if we are to secure the survival of endangered species”, added Trouvilliez. “Adaptive management is a double-edged sword - for species in decline, we might well have to set limits in terms of numbers and hunting periods, but we should not be afraid to take decisive action when wider conservation or human interests so require”. Persuading as many as possible of the remaining non-Party Range States to sign up is one of the tasks ahead. Another ambition which would also emphasize the success of the Agreement is to be able to start downgrading the threat status of the populations of some of the 255 listed species as this would indicate that one fundamental goal was being achieved – namely securing a favourable conservation status for African-Eurasian migratory waterbirds.